A scene from “In This Corner of the World,” directed by Sunao Katabuchi. Hollywood movies often look forward to future apocalypses; some Japanese anime reflects on catastrophes of the past. Among the latter are Isao Takahata’s “Grave of the Fireflies” (1988), about children struggling to survive World War II, and Hayao Miyazaki’s “The Wind Rises” (2013), which begins with the earthquake that leveled Tokyo in 1923 and proceeds to tell the story of the man who invented the plane that helped make Pearl Harbor possible. The painterly beauty of anime detaches the viewer from the terrible events depicted, but it also makes these cataclysms more accessible to the imagination. 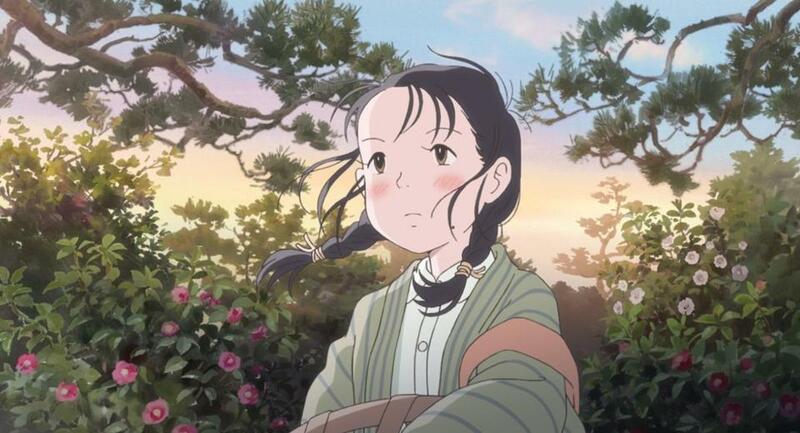 “In This Corner of the World,” adapted by writer-director Sunao Katabuchi (“Princess Arete”) from the 2007 manga by Fumiyo Kouno, is a new addition to this mini-genre. It is episodic, often shimmeringly epiphanic, and on occasion erratically narrated and sketchily animated (it has also received criticism, not entirely fair, for its purported advocacy of “self-victimization” and evasion of war guilt). The diary of the fictitious Suzu Urano (Non), it starts in 1933, when she is a young girl living in Eba, a small township in Hiroshima. In 1944, as her family seaweed-drying business faces hard times, she moves to Kure, a military port 14 miles away, with her arranged-marriage husband Shusaku Hojo (Yoshimasa Hosoya), the well-to-do son of a naval engineer. She records a life consisting of the quotidian, from the anxieties and daydreams of a schoolgirl to the later domestic routines of a housewife — homely commonplaces which Katabuchi renders with loving detail. Meanwhile, a war is going on — first far away, then closer to home as friends and relatives go off to battle and in some cases do not return. When the shortages set in, Suzu, her husband, and her in-laws must make do with scraps of wood for fuel and increasingly stark, makeshift meals (there is a fascinating montage showing how to make something appetizing from weeds and other detritus). Bombing raids begin hitting the city, people die, and while the world falls apart, the demands of daily existence and the duties of basic decency somehow keep this corner of it intact. Suzu does indulge in one luxury – drawing pictures. Katabuchi, a protégé of Hayao Miyazaki, plays off the character’s sketches of her surroundings and fantasies, deftly inserting them into the animation. It’s a sly suggestion that not only do the demands of habit and daily existence protect us from the nightmare of history, but so do art and imagination. Up to a point. Sheltered by mountains, those living in Kure notice only a flash, a brief shock wave, and a beautiful, terrible cloud on the horizon when the bomb explodes over Hiroshima. Only later does Katabuchi use the magic of animation to show the horror of what has happened. Written and directed by Sunao Katabuchi, based on the manga by Fumiyo Kouno. Starring Non, Yoshimasa Hosoya. At Boston Common. 129 minutes. PG-13 (thematic elements including war-related images).